The WSJ Wine Club is a wine of the month type club backed by the prestige of the Wall Street Journal. As a WSJ Wine Club member, you will receive 12 bottles of wine every three months. If you polish of a bottle of vino per week, this is a perfect schedule for you. If you are more of a "one bottle a month" type, the WSJ Wine club probably isn't the best option. There are many other great wine clubs you can check out that ship one or two bottles per month. The WSJ Wine Club is not run by the editorial board of the Wall Street Journal. The club is managed by a professional wine club company called Direct Wines. They also happen to manage a few other branded wine by the case clubs. This is good news for you as a consumer because this club sells a lot of wine. That means they are better positioned to negotiate with the wineries that are supplying the wine. Smaller clubs don't have the buying power and are forced to either find really cheap wine or to sell the wine at the market price. That is the only way for them to make money. Please note that this post has affiliate links. That means we will make money if you take advantage of this great offer. More details here. 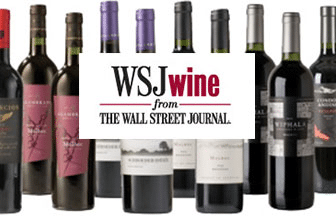 The WSJ Wine Club offers a great incentive to get you started. They typically offer some version of a case of wine (12 bottles) for 69.99. This is ONLY available on your first order. Also, it is only available one time per household. You can combine this with a deal from another wine by the case club if you want some great savings! The WSJWine Club will often sweeten the deal with additional bottles or a free gift. They rotate through the offers seemingly at random. The 15 bottles for 69.99 means you are getting quality wine for $4.70 per bottle. Those are Trader Joe's or Target prices, but for higher quality wines. Starting with your second shipment the prices increase to a more logical, but still good, level. The cases (12 bottles) will cost you 149.99 + 19.99 Shipping + Tax. That's about 15/bottle. That's not the cheapest wine in the world, but it's a nice price for quality wine. You also save the annoyance of driving to the supermarket or local wine store to pick up a bottle. The WSJ Wine Club allows you to make changes to the wine they are going to ship you. You can manage these changes via the web or by calling them. You can also skip a case if the wine is piling up or you are headed out of town. The club also allows you to cancel the wine shipments at any time and for any reason. So we hear what you are thinking, what about the wine. What is the WSJWine Club going to ship to me? How good is the WSJWine Club's wine? Here are a few selections from past shipments. This should help give you an idea of the type of wine the WSJWine Club ships. J Opi Malbec 2017: This wine receives 4 out of 5 stars on its Vivino reviews. Field of Stones Sauvignon Blanc 2016: This wine averages 3.8/5 from Vivino reviewers. As you can see, these are quality wines. These are from known producers around that globe. This wine club is perfect for a moderate wine drinker who likes quality wines at a good price point. The introductory deal is fantastic, so this can also appeal to value shoppers. You will receive wines from around the world. You also get to customize what the WSJClub sends to you. The WSJWine Club | How do I order? We've provided two nice red buttons for you to order the WSJWine club, so go click away!